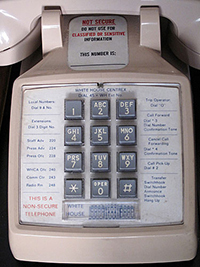 Have you ever thought about the phone system at the White House? An excess of 3,250 people work in the white house and this doesn’t include part-time staff. How do they handle that many people on a phone system? Organization. The future is now. Tron is here. Light sabers on, proton torpedoes ready — engage! Yes, technology really is taking over. Very soon we’ll all be encased in carbonite while a giant worm named Jabba enjoys entertainment in his private studio. The same can go for small businesses! Okay, not many people these days are listening to their voicemails. The hustle and bustle of life has gotten so hectic, a businessperson could save 30 minutes a day from erasing every voicemail left on that day! How’s that for efficiency? Still, if you’re a small-business entrepreneur, you need to make sure you’re in contact with your clients. And that, unfortunately, means keeping an eye (actually an ear) on your messages. It’s absolutely crucial. Clever, huh? That’s what IVR stands for, for me — Invaluable Viable Resource. No, really, it actually means “Interactive Voice Response.” What the heck do I know, right? 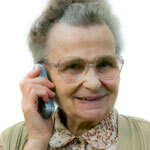 Halloo Hints: How do I know if it’s a Halloo call and not my Grandmother? Q: When the Halloo system forwards a call to my cell or home, is there a way to know that it is a Halloo call as opposed to say my grandmother calling in? A: On the “Forwarding” page of “User Settings”, click “Use my Halloo number for Caller-ID” and “Save Changes”. Your caller-ID will show your Halloo toll free number instead of the original caller. Q: I have selected “Rings before voicemail picks up”, but I really need to be able to set extensions to forward only (without ever going to Halloo voicemail). Is this possible? A: Simply set the “Maximum incoming voicemail length” setting to “0” for the extension(s) that don’t want voice mail. Note that if you record a greeting for that extension, it will still play, which will allow you to record a brief message before the script hangs up. In addition, if you check the “For further assistance” option, the caller will be given the chance to jump to another extension, including back to the auto attendant. Our webmaster made a good point once – asking customers to dial a separate number is like asking website visitors to make extra mouse clicks. They both lower the conversion rate.